Out of the blue a month or two ago we got a notification from our BT MyDonate account that someone had set up a fundraising page for the Jo Walters Trust to run the Athens marathon. 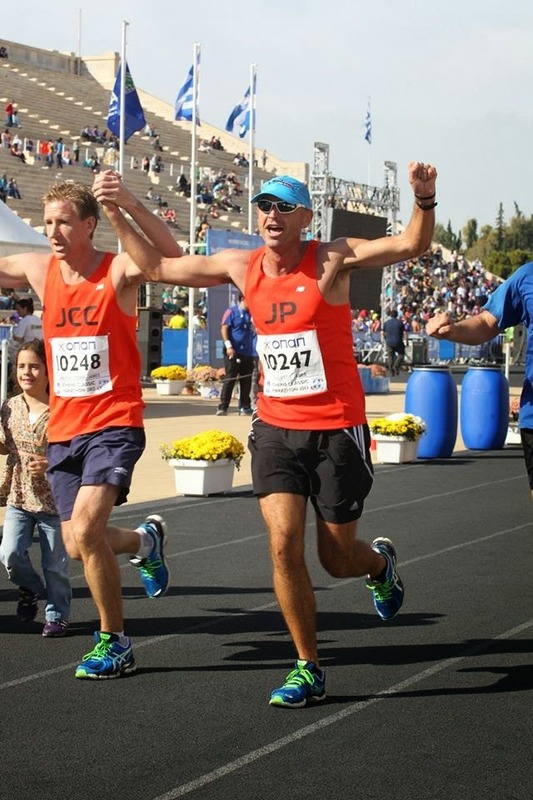 After a bit of digging it turned out to be not one, but two chaps, James Cameron-Cooper and Jimmy Philippson, who were brave enough to attempt to follow in the footsteps of Pheidippides, though hopefully not with the same end result. The great news is that they not only completed this very tough marathon, they did so with a fast time, and in so doing, raised over £1,000 for the Jo Walters Trust. We are hugely grateful, and are proud to share this report they sent, along with a few pictures. The Jo Walters Trust banner is rapidly becoming a very well travelled item. It should be back from Athens soon though, so if you have a good idea for a fundraising effort, let us know if you would like to add some more miles to the banner's travels! Needless to say it was an exceptional experience. Running partner, Jimmy Phillipson, had rustled up some fine customised vests, which coupled with our, coincidentally, matching footwear made for a promising outing. Having kept the local brew to a minimum the night before we were up at 6.30 (4.30 UK time) and kindly driven to Marathon by my father. A jovial atmosphere and an ever warming sun greeted us at the start. We were clearly going to get a tan as we ran. To give the other 12,000 runners a head start, we were at the back in Block 7. Each of the blocks went off at 5 minute intervals, with the elite runners starting at 9am. Fortunately the timing chip in our bibs would start as we crossed the line, record split times along the course and provide a final time at the finish. Our ambition for the 26.2 miles / 42 kilometres was a time under 4 hours. Game on. Dancing through the throng we made steady progress. Water stops came and went every 5 kilometres with a bottle of water eagerly consumed at each. In between, the crowds kept cheering and the kids kept hanging out a hand for a high five. We were happy to oblige. Roadside DJ’s playing a mixture of songs from Daft Punks ‘Get Lucky’ to Zorba the Greek kept the beat going as we reached half way. Entering Athens for the final six miles / 10 kilometres, runners increasingly succumbing to cramp, a succession of steel bands creating thunder with their drums was a welcome and invigorating lift. Eventually, drawing deeply on unknown reserves, we headed into the Kallimarmaro Stadium (meaning beautifully marbled) and, arms raised aloft, crossed the line in 3 hours 37 minutes. It had a been a physical and emotional rollercoaster but one that we would certainly consider doing again!